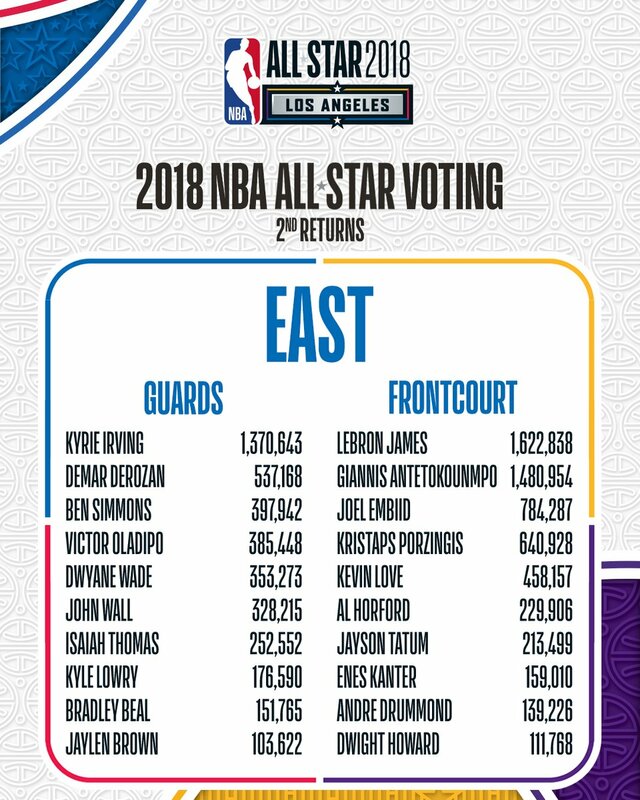 After leading the initial return of fan voting for the 2018 NBA All-Star Game, Giannis Antetokounmpo slipped to second spot among the leading vote-getters the NBA revealed on Wednesday. Despite a nearly 7,000-vote lead over Lebron James in the initial results, Antetokounmpo was overtaken by the Cleveland Cavaliers superstar who amassed the most votes in the entire league with more than 1.6 million votes. Antetokounmpo, who is targeting his second appearance at the NBA’s mid-season classic, raked in just over 1.4 million votes. Despite trailing James in the voting totals, Antetokounmpo is still the second-highest vote-getter in the league ahead of the likes of Stephen Curry, Kyrie Irving, and Kevin Durant. The leading vote-getter from each Conference will be named captains for the All-Star Game, and will be responsible for picking their team. The 2018 All-Star Game will be held at the iconic Staples Center in Los Angeles on 18 February. Fans, who will account for 50 % of the vote, can continue voting for the Greek Freak via multiple outlets which can be viewed here. The fastest and easiest way is to post on your social media platforms (Facebook, Instagram, Twitter,e tc.) with Giannis Antetokounmpo accompanied by #NBAVote.